LOS ANGELES — Kliff Kingsbury, one of college football’s top offensive minds who has produced explosive offenses and developed prolific quarterbacks, has been named the offensive coordinator and quarterbacks coach at USC, Trojan head coach Clay Helton announced today (Dec. 5). Kingsbury, 39, has tutored such future NFL quarterbacks as first rounders Patrick Mahomes, Baker Mayfield and Johnny Manziel, along with Case Keenum, Davis Webb and Nic Shimonek. Kingsbury spent the past 6 seasons (2013-18) as the head coach at his alma mater Texas Tech, where he also called the plays for the Red Raiders’ high-powered offense that each season ranked in the national Top 10 in passing yards and in the Top 20 in total offense. Each season during his tenure, his teams averaged at least 30 points per game (including twice over 40 points), 470 total yards (4 times over 500 yards) and 330 passing yards (twice over 460 yards). In 4 of those seasons, his teams also rushed for at least 140 yards per game. Texas Tech went 8-5 in his initial 2013 season, including a win in the Holiday Bowl. Using a pair of true freshman quarterbacks in Webb and future Heisman Trophy winner and No. 1 NFL pick Mayfield, the Red Raiders were second nationally in passing offense (392.8) and eighth in total offense (510.7) while averaging 35.8 points per game. With a team plagued by injuries in 2014, running back DeAndre Washington became the first Red Raider to rush for 1,000 yards since 1998 (1,103). Texas Tech was fifth nationally in passing offense (351.1) and 10th in total offense (504.1) while scoring 30.5 points en route to a 4-8 record. In 2015, Texas Tech was second in the country in total offense (579.5), passing offense (388.2) and scoring offense (a school-record 45.1). The Red Raiders were one of just two schools to score at least 25 points in every game that year. Mahomes, just a sophomore, threw for 4,653 yards with 36 touchdowns and became the youngest quarterback in NCAA history to amass 5,000 yards of total offense as he led the nation in that category (393.0). He also ran for 10 TDs. Wide receiver Jakeem Grant set the school career receiving yardage record (3,164), while Washington ran for 1,000 yards again (1,492), becoming the first Red Raider with consecutive 1,000-yard rushing seasons since 1995 and 1996. It was the first season ever that Tech had a 4,000-yard passer, 1,000-yard rusher and 1,000-yard receiver. The Red Raiders went 7-6, including their first win at Texas since 1997, and played in the Texas Bowl. Texas Tech led the nation in total offense (566.6) and passing offense (463.0) in 2016 and was fifth in scoring offense (43.7). Mahomes won the Sammy Baugh Trophy as he led the nation in passing (421.0), throwing for 5,052 yards (he was just the third quarterback ever to have back-to-back years with 5,000-plus yards of total offense) and 41 touchdowns while adding 12 rushing TDs. Tech went 5-7 in 2016. The 2017 Red Raiders advanced to the Birmingham Bowl and finished with a 6-7 record. Behind Shimonek, Tech was ninth nationally in passing offense (333.7) and 16th in total offense (474.6). In 2018, the Red Raiders ranked fourth nationally in passing offense (352.6), 12th in total offense (485.2) and 16th in scoring offense (37.3). Texas Tech had a 5-7 mark, giving Kingsbury a 6-year overall head coaching record of 35-40. Kingsbury began his coaching career at Houston for 4 seasons, first as the offensive quality control coach for 2 years (2008-09), then as the Cougars’ quarterback coach in 2010 and adding co-offensive coordinator duties in 2011. Houston led the nation in total offense (599.1), passing offense (450.1) and scoring (49.3) in 2011, while Keenum completed his record-setting career as the most prolific passer in NCAA FBS history (he was seventh in the Heisman Trophy voting and won the Sammy Baugh Trophy). Kingsbury was named FootballScoop.com Offensive Coordinator of the Year. In 2010, freshman quarterback David Piland replaced an injured Keenum early in the season and was third nationally in passing yards (330.1), earning Freshman All-American honors. Houston played in the 2008 and 2009 Armed Forces Bowl and beat Penn State in the 2012 TicketCity Bowl. Kingsbury spent 2012 as the offensive coordinator and quarterbacks coach at Texas A&M, helping Manziel become the first freshman to win the Heisman Trophy. The Aggies were third nationally in total offense (558.5), sporting a balanced attack that was 13th nationally in rushing offense (242.1) and 14th in passing offense (316.5). Texas A&M beat No. 1 Alabama on the road and No. 11 Oklahoma in the Cotton Bowl. 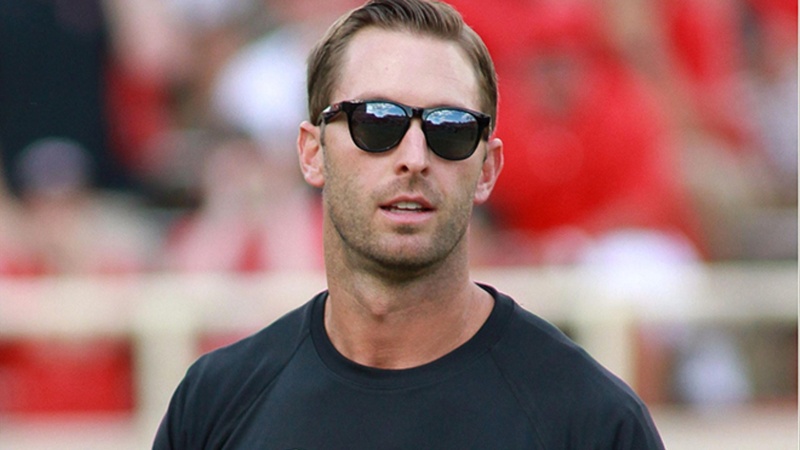 For the second consecutive season, Kingsbury was the FootballScoop.com Offensive Coordinator of the Year. Kingsbury had a record-setting career as a quarterback at Texas Tech from 1999 to 2002, the last 3 seasons playing under head coach Mike Leach. In his career, he had more than 12,000 passing yards and total yards, with 1,000-plus completions, making him only the third player in NCAA history to accomplish all 3 feats. He set 39 school records, 16 Big 12 marks and 17 NCAA records. As a 2002 senior, he won the Sammy Baugh Trophy and was the Associated Press Big 12 Offensive Player of the Year. He received his bachelor’s degree in management from Texas Tech in 2001. He was a National Football Foundation Post-Graduate Scholarship winner and was the CoSIDA Academic All-America Player of the Year in 2002. He was the New England Patriots’ sixth round pick in the 2003 NFL Draft. He spent 2003 on injured reserve with the Patriots, then was on the New Orleans Saints’ practice squad in 2004. He played for the New York Jets in 2005, appearing in 1 game, then attended the Buffalo Bills’ training camp in 2006. He played for the Cologne Centurions of NFL Europe in 2006, then signed with the Montreal Alouettes of the Canadian Football League in 2007 before spending that season with the Winnipeg Blue Bombers. He played football for his father, Tim, at New Braunfels (Tex.) High, and also was on the baseball, basketball and track teams. He threw for 3,009 yards and 34 touchdowns as a senior. He was a 2018 inductee into the Texas High School Football Hall of Fame. Born on Aug. 9, 1979, he is single.